Enamelware has experienced a surge in popularity due to the current interest in mid-20th century design. The smooth, easy-to-clean surface of enameled metal kitchenware has also become popular due to concerns over toxins in plastic products and no-stick pots and pans. Originally marketed in the 19th century as a safe alternative to toxic materials found in kitchen products, it seems as if we have come full circle. Vintage pieces can be found at thrift shops and at yard sales and are very affordable. Of course, there are types of enamelware that are rare or in high demand that are quite expensive. Even chipped or partially-rusted vintage pieces can be attractive for those who like a rustic country look, though damaged goods are not advised for cooking or eating purposes. 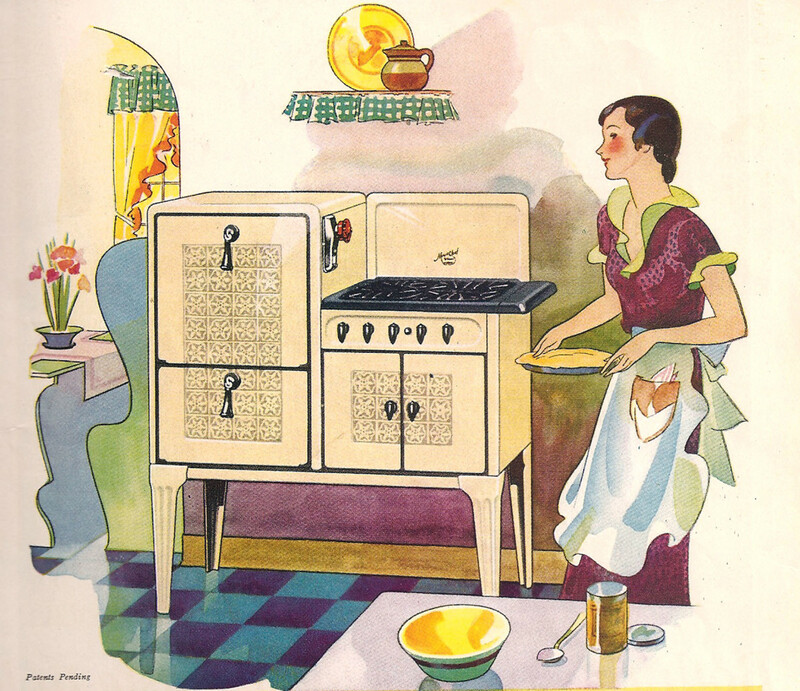 Fortunately, there are many new enameled kitchen products on the market today that are safe and useful. Enameled metal has been used for thousands of years in ancient Rome, Greece, and Persia for jewelry and in the decorative arts. Vitreous enamel was developed in Germany in the mid 19th century. A ground glass called frit is applied to metal then fired at temperatures hot enough to melt glass but not the metal. Minerals added to the frit produce color. The process has been used for advertising signage, medical equipment, kitchen appliances, bathtubs, cookware, dishware, basins, and pans. The term "enameware" refers to enameled steel or cast iron. Early products were usually white. Usually, Britain produced white enamelware with a dark blue rim. Swedish products were cream colored trimmed in green. Though many patterns and colors were developed over the years, the inside of an enameled cast iron pot was usually white. Today's popular enamelware Dutch ovens which are enameled cast iron are white inside. 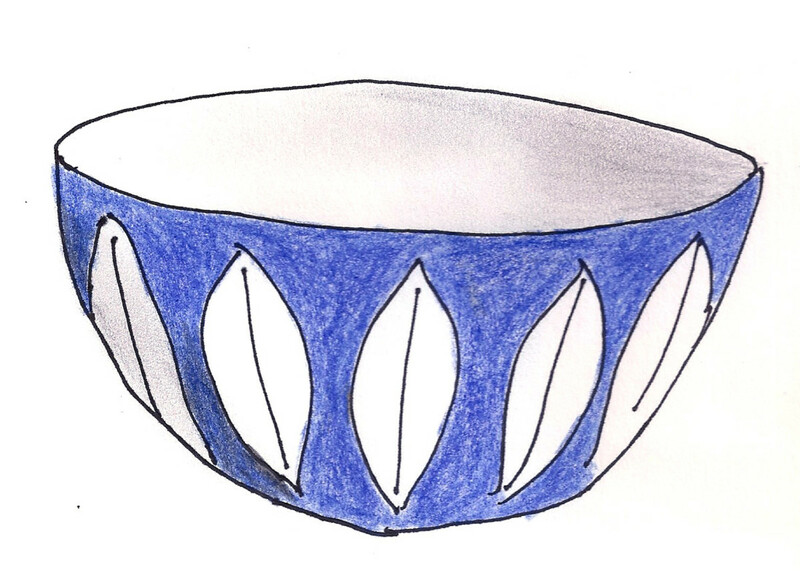 By the late 1800s blue spotted Agateware became popular. 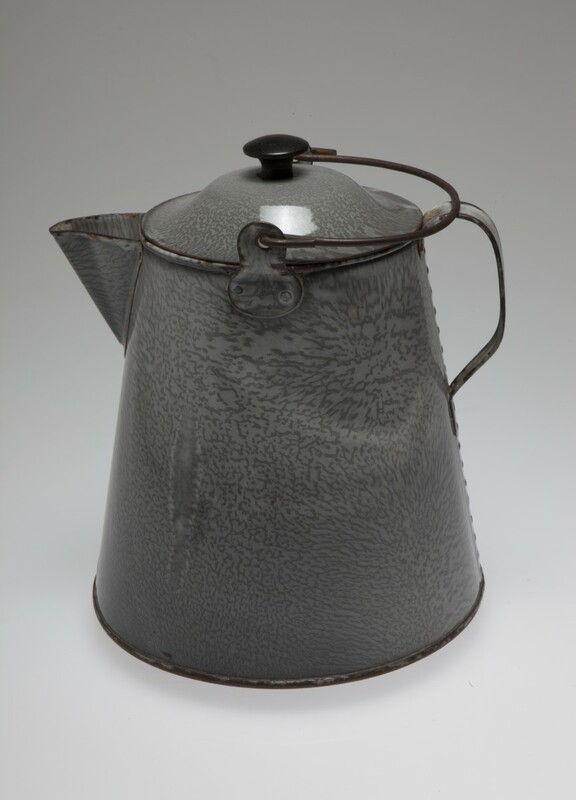 In the 1890s, Agateware which was enameled nickel and steel, was marketed as a sanitary alternative to kitchenware that used lead and arsenic in its production. Granitware mimicked the look of granite. Developed by Charles Stumer and produced by the St. Louis Stamping Company, it was originally called Granite Iron Ware. The term "granitware" eventually became a generic term for specked gray and white enamlware. Later patterns included stenciled flowers, checkerboard prints, a chicken wire print, sentimental cartoons, marbling, fruits, polka dots, hearts, and leaves.Enameled canisters were printed with the words of the intended contents such as flour, sugar, and tea. 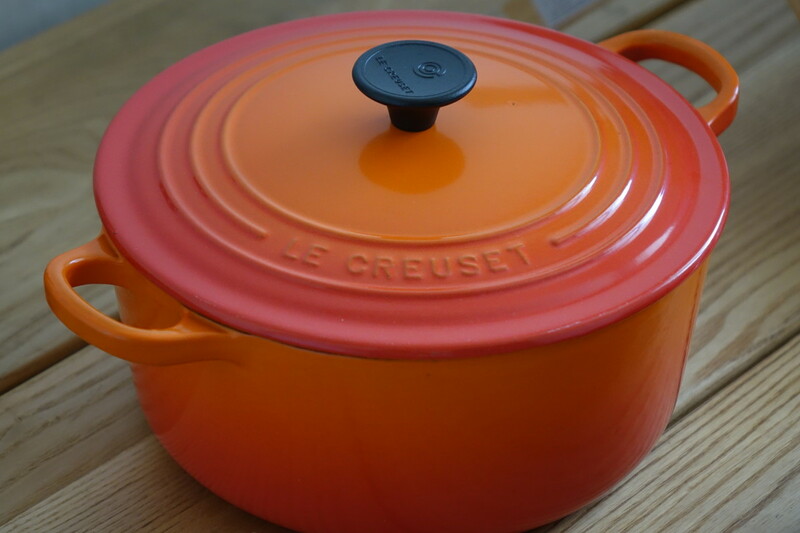 Le Creuset, a French company, began producing their popular brand in the 1920s creating the iconic Dutch oven in "Flame" which was orange. They introduced yellow in 1956. Today, Le Creuset's products come in many colors including blue, green, gray and white. Julia Child, mother of the modern food movement, used Descoware made by a Belgian company. Her cooking show introduced many people to French cooking using fresh ingredients in classic enamelware cookware. Enameled cast iron is very heavy. It can be found in a wide range of prices. Higher priced products are long lasting and believed to be less prone to chipping. 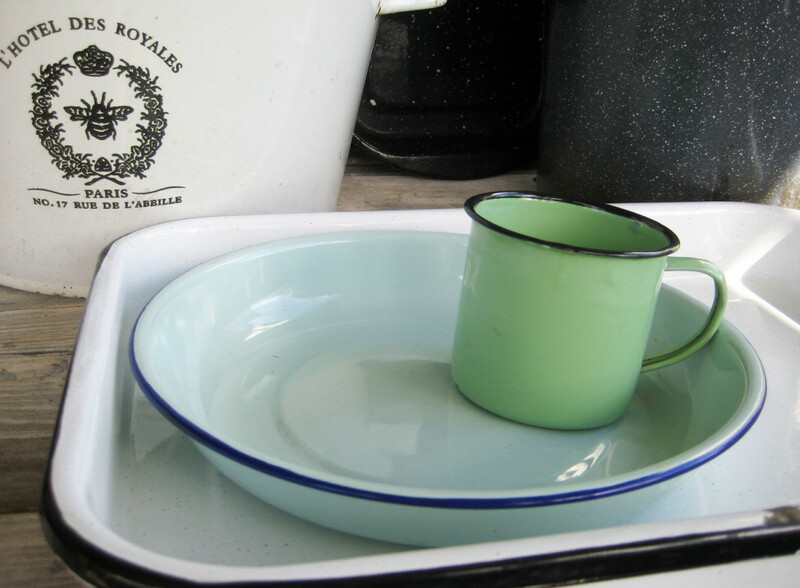 Vintage enamelware is quite inexpensive especially if it is marred, chipped, or shows some rust spots. However, as with most older goods, there is a demand for particular brands and types. Unusual styles and colors are popular with collectors. 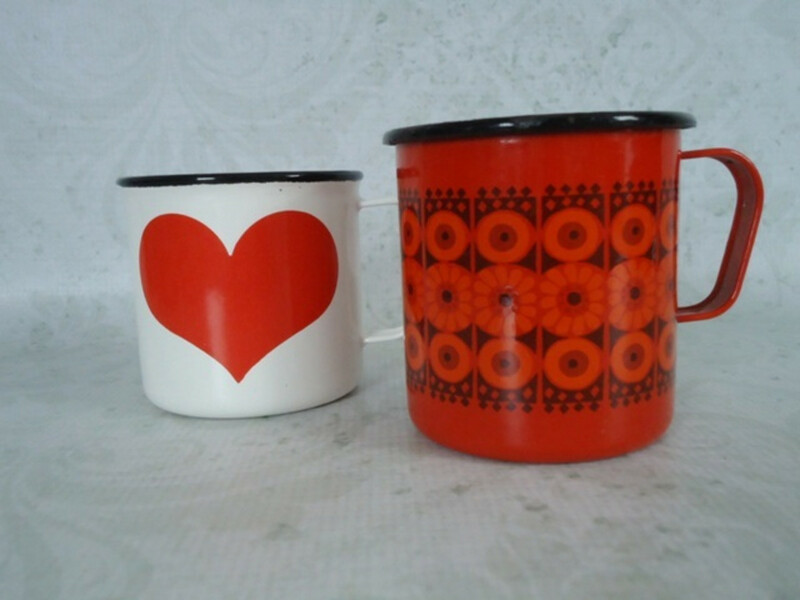 Prices are very high for Scandanavian mid 20th century enamelware. Products designed by Cathrine Holm for the Norwegian company Grete Pryte Kittelsen are brightly colored with simple patterns. Illustrated here is the Lotus pattern. Produced from the 1950s to the 1970s, these command top dollar on online auction sites. Kaj Franck Finel also created attractive enamelware in the mid 20th century. The intense colors and iconic designs are highly prized by collectors. You can loosely date some mid century pieces by color. The 1950s and 1960s brought us bright basic colors like red, white, and bright green. Examples from the 1970s often come in fall colors like harvest gold, dull orange, and avocado green. 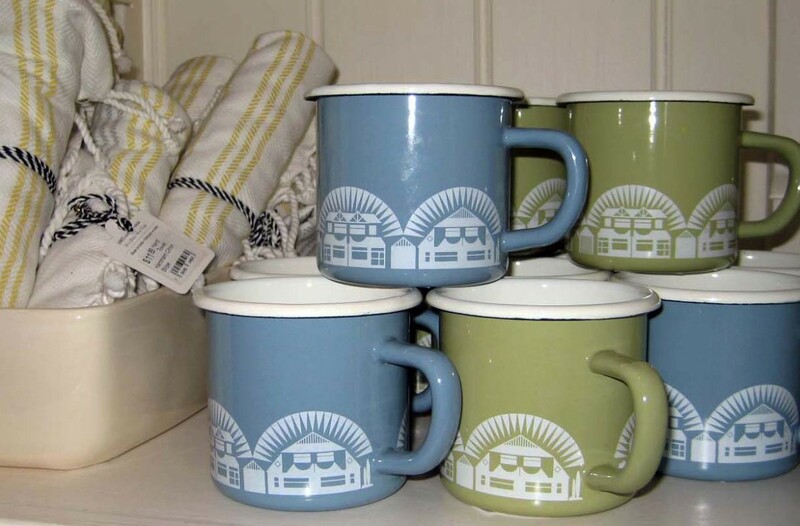 Enamelware from the 1920s and 30s with cute, sentimental designs are not nearly as expensive as mid 20th century products. Old enamelware can be put to any number of uses. Chipped or partially rusted pieces look charming and evoke a rustic feel to a kitchen or to an outdoor gathering. They work well for picnics, cookouts, or a tea party on a wide porch. You can enjoy your old enamelware even if it is slightly toxic. Coffeepots and mugs can hold a flower arrangement. Use a mug to hold utensils. Place the forks tine side up like a flower arrangement. Line a large bowl or basin with a linen towel and fill with breads, muffins, or rolls for a party. Fill large basins with ice and stock with bottles of soda, beer, or wine. Use a large shallow pan as a serving tray. Fill an old saucepan with berries. First, line it with cling wrap. Once it's filled, you won't even notice the plastic wrap. It will look like you just picked the berries! When you buy a new enamelware Dutch oven, wash with warm soapy water using a soft cloth or sponge. Towel dry. If there is exposed cast iron on the rim, season the iron. Run a paper towel coated with cooking oil around the rim and place in a warm (not hot) oven for 15 to 20 minutes. This will prevent rust. Never use steel wool pads or abrasive cleansers as they will scratch the smooth surface. Do not air dry. Use a towel. Do not bang on your enamelware pot or bang the pot on a hard surface. Do not use metal utensils. Use wood or silicone spoons and spatulas while cooking to avoid marring the surface. If stained, soak overnight using 1 part vinegar to 1 part water. Wash and rinse. Towel dry. You can use a bit of bleach water to remove stains. Make sure you wash and rinse and dry. For stains, rub a paste of baking soda and water on the stain. Wash, rinse, and dry. We found an old enamel large pan with a paddle inside and a lid with a motor that turns the paddle. Do you know what it is? Of course, I can't see what you mean so can only make a wild guess. It sounds like an electric butter churn. 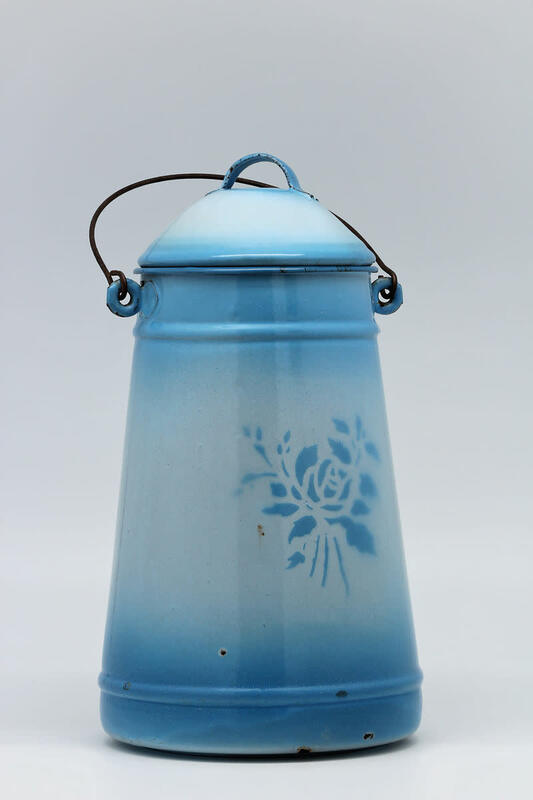 Small glass butter churns were produced for home use in the late 1800s. When electricity became available, electric churns became an item. They were produced by several companies. Look online for vintage or antique Dazy Electric Butter Churn, Farm Master Electric Butter Churn, or Ward's Custom Electric Butter Churn. These three featured an enamel container. My black/with white spots enamel pan turns cooked food black. Is this safe to eat? You may be cooking with the heat turned up too high and burning your food. Lower the flame to avoid burning. I would not recommend eating burned food. Perhaps there is a build-up of grease in your pan. Clean the pan. You can cover the bottom of the pan with powdered detergent, lay a wet towel over it, allow to set for several hours, then rinse clean. You can also fill your pan with a mixture of one part bleach to three parts water, allow to set over night, then clean in the morning. That should remove old grease and stains. Is it safe to use Sanko Ware Show Pans for cooking? 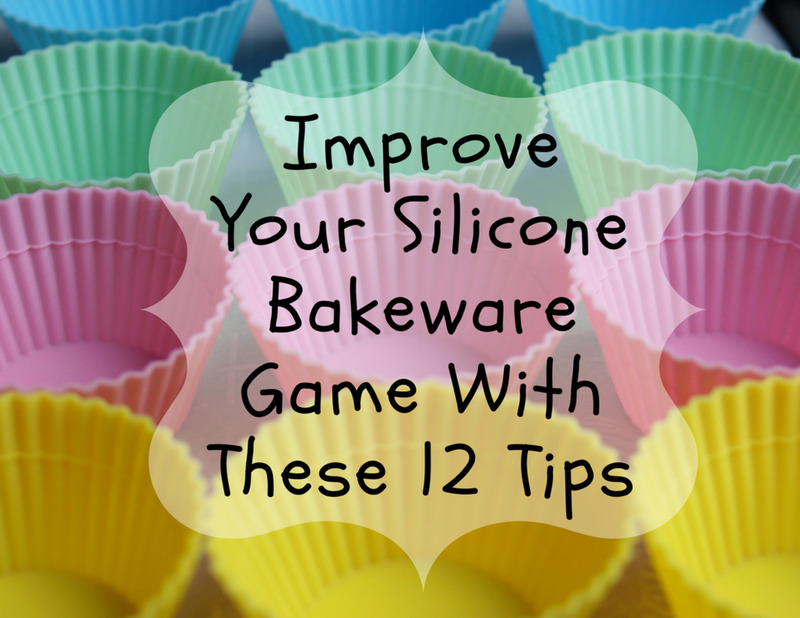 In general, you don't want to use enamelware that is marred, cracked, chipped, or worn. Lots of people use older enamelware without worry. Personally, I would not, preferring newer products for cooking. 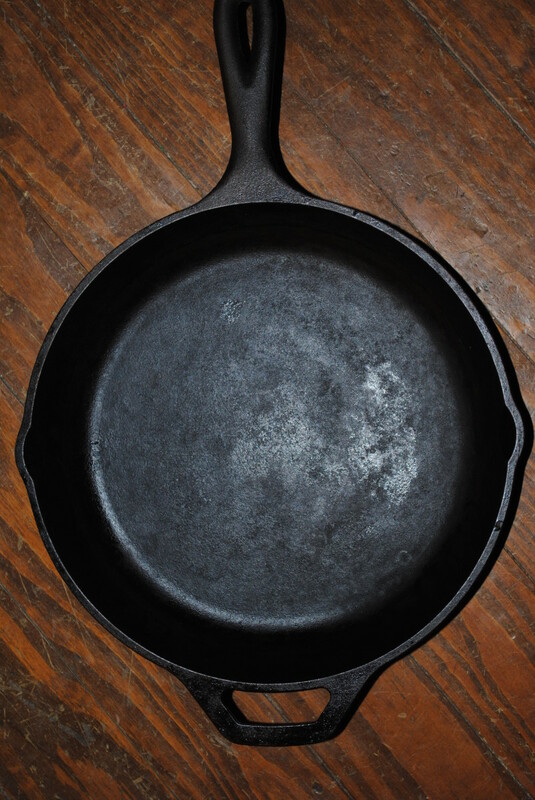 (Which sounds like rubbish because I cook with a 100-year-old iron pan almost every day). But when you are in doubt, the safe bet is not to use it. Those pretty 1970s enamel pots and pans are nice decorations for your home. I have a Cornucopia fruit patterm dutch oven. Is it safe to cook with? I like the old adage that when in doubt go with your instinct. That being said, enamelware should be safe to cook with. The enamel is over steel. Do not use the dutch oven if the enamel is wearing off or cracked. Hand wash it in warm water. Do not clean with abrasive materials or cleaners. But if you feel nervous about using this product for cooking, you can always use it for decorative purposes. Use it as a vase for flowers or to hold napkins. Can the worn white interior of my vintage Dru Holland ware be repaired and if so, where? There are people out there who suggest that the enamel can be repaired with a food safe epoxy, but most experts and manufacturers will not recommend using it for cooking after the repair. Personally, I would not cook with vintage enamelware. Toxic metals have been used in the past to coat iron. These include lead and cadmium. Please do not use damaged enamelware. Chipped or worn edges can break off and wind up in your food. If I were you, I'd use the pot as a display piece. Use it to store small items, as a container for a flower arrangement, to store recipes, or anything your imagination can come up with. Do you know anything about Grant's Wearite Enamelware? I can't find anything on the web. I have a 3-quart pot with the number 22 on the label, and the label is still intact. Older books will not reflect current values but will help you identify what it is that you have (which you already know), when it was made, etc. Finding the value may take some patience as you search for sales of that particular item or something similar such as a different sized pot. Hi Marilyn - personally, I would not use a Catherine Holm bowl for everyday use for fear of staining or damaging it. Her products are so beautiful and highly collectible. You say that it is best to avoid cooking in vintage enamelware but what about the Catherine Holm bowls for food? Is it just the high temps that we are trying to avoid or is it all food contact? Hi Susan - as regulations were not as strict in the old days, you may want to avoid using your bowl for food. While it shows no cracks or chips, toxic chemicals like cadmium and lead were once used in the production of brightly colored enamelware. I am sure that you can find another use for you bowl. While I can not state if the bowl is safe or not, it is better to use caution. Are mid century items safe to use for cooking? I just purchased a small yellow bowl that was made in Yugoslovia. It is in perfect condition. Hi Kathleen - when in doubt, don't use it. Older products that were made before the more stringent regulations that we have today may contain lead or cadmium, especially yellow, red, and orange. I can’t find s definitive answer to my question. I have s few old Descowsre pieces with the grey interior. I have never used them as can’t find out if the old grey interiors sre safe and non toxic. Hi Penny - in general I would avoid using vintage enamelware for actully cooking. They can certainly be used for flowers, as containers for napkns or utensils, or any other decorative purpose. I am very interested in purchasing vintage enamelware as my every day cookware. Do you know if either the JMP or Johann Havilland brands are toxic to use for cooking? Hi Peggy - yep! There are many modern examples of enamelware that are safe to use. The older stuff is wonderfully decorative. This would certainly give a vintage look to home decor if using or displaying this vintage enamelware. It is amazing to think that uranium, lead and/or cadmium was once used in the making of these pieces. Considering that I think that it is probably best to use them for display only. Flourish Anyway - I love those things. Some of the old Hoosiers (if that's what yours is) had a little cupboard with a built-in flour sifter. They were so cute! Hi Ms Dora - thanks! I always fondly remember that big blue enamelware roasting pan and the wonderful smell of turkey at Thanksgiving. Hi Genna - I took a photo of a few of my own examples of enamelware and when I looked at the picture I realized that I had left so many pieces out. I am not too fond of cooking on top of the stove with my enamelware Dutch oven but use it in the oven. Thanks! I love Dutch ovens, Dolores...I use one all the time; they cook beautifully. 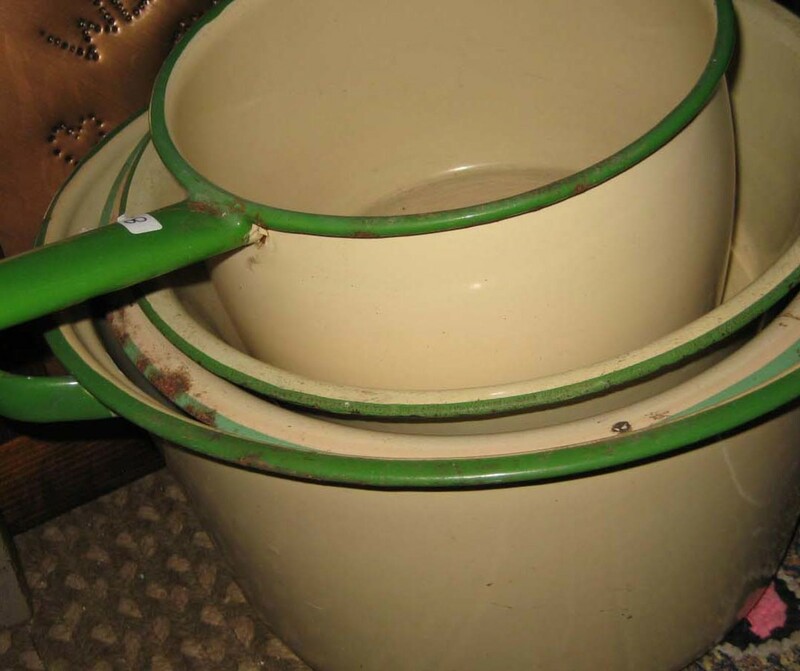 Thank you for the cautions about using older enamelware, and the toxins they may have. Very helpful! Thanks for bringing back fond memories of enamelware around the house. I grew up with enamel drinking mugs, also enamel basins before we had showers and sinks. How we cherished them and tried to protect them from chipping. Your article inspires new appreciation for them. Love, love, love vintage dishes, especially shabby chic enamelware. Wonderful article, Dolores. Hi pstraubie48 - I am a big fan of thrift shops myself. Angels always welcome! My great grandmother passed some kitchen pieces including a cupboard with an enameled top down to me. This was helpful in its suggestions for how to use the items for entertaining. Thank you!